MY FATHER’S ASHES rest in three places. One, a mountainside in North Carolina at a Unitarian retreat center. Two, outside his favorite motel room in north Georgia. 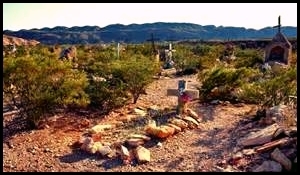 Three, next to an old cowboy cemetery in West Texas. I don’t know where my mother’s ashes are. I suppose my sister has them. My only aunt died recently at 88, and she too was cremated. I don’t know where those ashes are either. But clearly we are people who go up in flames, and that has long been my plan. Recently, however, I read something that deflected me from that death desire. There was mention of a custom-made casket of cedar. A cedar casket, like a fresh cedar closet, would smell good — to me, the inhabitant, resting inside. As I pondered the aroma, other aspects, dramatic ones, came to mind. I pictured myself lying inside my cedar casket, dressed in my best and only suit that hangs in the Hacienda closet, my favorite tie with a picture of a happy cow, my arms straight down, one hand atop the other, eyes shut. That end of movement we all reach one day. It’s a scene as old as the ages, the occupied coffin. But where would I be planted? Two options: here inside the Hacienda compound with just a small marker that could be removed if necessary to avoid creeping out future homeowners. Or at the neighborhood cemetery beyond the plaza. I vote for the cemetery. Every 2nd of November, my child bride would sit among our neighbors, there at my marigold-bedecked mound, resplendent with candlelight and incense. And I would be inside my sweet-smelling casket with a barely discernible smile. Funny thing. I have always thought I would vie for the cremation route until my wife’s father said that he had reserved a spot for me in their family plot (in Puerto Vallarta in the graveyard that overlooks the sea). Very sweet gesture. I think looking out over the sea forever in eternal rest might not be so bad. Mike: Sounds like a great plan to me. Get yourself a tie with a smiling cow. I’m leaving my beautiful cadaver to science! Peter: You get Brownie points for that. I don’t like the idea of slowly decomposing. Therefore, I choose cremation. Carole: Most everybody above the Rio Bravo is embalmed. I wonder how long that draws out the process, or maybe it makes you stay the same as the day you died forever. I really don’t know. In Mexico, embalming is not the norm. You go into the ground as is. Funerals are held rapidly, and you’re buried quickly, like in the good old days, before you began to smell. Part of the appeal, as I see it, especially as it is done here (no embalming) is that one slowly changes into what we expect from horror movies. Dig into the grave, open the coffin and Yipes! Much rather be in the ocean than under the snow. Andean: But there’s a third option: in a cedar box beneath the soil’s surface! In a land where it does not snow, of course. Ahh, options, as opinions vary, hopefully respected, whether dead or alive, and wherever we live! I’m not going to worry about this one for a good, long while. If the need arises suddenly, it’ll be someone else’s problem. Where there are charming old cemeteries all over the place. Kim: We never know when our time is up. Till it’s up. Just stand me in the corner with the mummies in Guanajuato! Smiling. Señor Farnsworth: We Mexicans have a rule. Gringos cannot be propped up there in Guanajuato. We keep some things to ourselves. However, your suggestion might apply to me. I would look quite interesting there, I think. I’d have to be left in the cedar coffin for a long time first though. This is another argument against cremation. Thanks for the suggestion. Come again. I wasn’t aware that you could be buried on your own property. In that case, we’ve got 25 acres some with nice views of the lake that I think I will look at. Cedar, that does smell nice. Wonder how expensive one of those coffins would be. Tancho: I don’t know if one can be buried at home or not. I’m just guessing here. I think I’d rather have a cedar wrapped cigar before I go. The cigar ash would be a sort of rehearsal. Don Cuevas: Smoke those cigars while you still can, amigo. We’re not getting any younger.